The municipality of Casabermeja stretches from Montes de Málaga to the south of the Torcal and Cabras ranges. It is the main gateway to the Antequera region and a metal bull, so emblematic of Spain"s roads, welcomes us to the town, after a fashion. This inland Malaga town has three sites declared Places of Cultural Interest. Its picturesque cemetery, which has inspired curious myths throughout history, is one of them, and a must-see in Casabermeja. In addition, the city is an ideal environment for hiking and outdoor activities. Casabermeja is especially known for the San Sebastian Municipal Cemetery. The originality of its pantheons, burial mounds and pinnacles led to it gaining National Monument status in 1980. Its whitewashed niches have three parts: a bottom for the deceased, a central part for the headstone and a decorative front part at the top. This peculiar structure made many outsiders believe that in this town the dead were buried standing. No, they are not. Among the archaeological remains located in the municipality of Casabermeja, a highlight is the set of paintings at Peñas de Cabrera. This prehistoric site, featuring rock paintings, is listed as a Place of Cultural interest. Inherited from Casabermeja"s Arab past is the Zambra Tower. Located four kilometers from the town, it was built in the thirteenth century to guard the land the municipality now occupies. Also worth a visit is the Casabermeja Ceramics Workshop/Museum, conceived as an exhibition space and studio. The most notable building in the village is the parish church of Nuestra Señora del Socorro. Founded in the sixteenth century, but later reformed, it consists of three naves separated by semicircular arches. The exterior of the building is distinguished by the tower, with five sections. The temple, declared a Place of Cultural Interest, contains valuable pieces of antique jewelry. 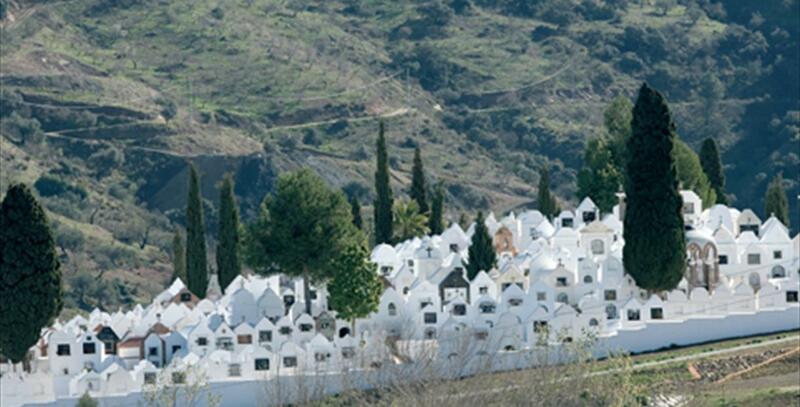 To get to Casabermeja by car from Malaga, the quickest option is to take the A-45 to Exit 124. This route takes approximately 27 minutes. You can also opt for public transport, taking the intercity bus in Malaga towards Riogordo and getting off at Casabermeja. The Guadalmedina River runs through the municipality of Casabermeja, which extends as far as the Montes de Málaga Natural Park. Several hiking trails pass through this place of great ecological value, which covers almost five thousand hectares predominantly covered with the pine, gallery forests and waterfalls. This gigantic "green lung" has several recreational areas and an environment education center. Other sites of interest are the Peñas de Cabrera, with their shelters formed by the weathering of wind, and the viewpoints of Torre Zambra and Mallén. The latter sits at the highest point of the municipality of Casabermeja, offering spectacular panoramic views. In July, the Great Song Festival of Casabermeja takes place, one of the most important festivals of the Andalusian flamenco genre (declared by UNESCO Intangible Heritage of Humanity). In August, the pilgrimage of Nuestra Señora del Socorro and the Town Fair take place. Back in September is the turn of the Malaga Goat Fair, with which this town in the region of Antequera celebrates its livestock farming tradition. Other notable events are Carnival, the festival of St Mark and the Festival of St John, which is a tradition where rag dolls known as júas are burnt. At the Festival of St Sebastian, patron saint of Casabermeja, there is a procession of the saint from the church of Nuestra Señora del Socorro to his hermitage in the Cemetery. After the parade, the village restaurants offer a tasting of typical local dishes. During Holy Week, several processions take to the streets of Casabermeja, while for Corpus Christi, the Monstrance passes through the town, lavishly decorated for the occasion with flowers. Religious acts give way to revelry and for four days the town is filled with music, dancing and fun. Casabermeja"s traditional recipes include such varied dishes as olla de la era (a chickpea stew with squash, beans, eggplant and meat), migas (bread, garlic, vegetables, cured meats, etc, a hearty peasant recipe), rabbit with garlic, gazpacho (a summer soup of tomato, pepper, cucumber, garlic and olive oil, all blended), the goat in pepitoria (a sauce thickened with egg yolk) and the plato de los montes (pork loin in lard, with potatoes, peppers and fried pork). For those with a sweet tooth, we recommend borrachuelos (a typical Christmas pastry) and oil or lemon cakes. Casabermeja has been a place of human settlement since the dawn of time. The prehistoric paintings in Peñas de Cabrera and the Aeneolithic burial site in Monte Calvario, among other traces, attest to the presence of man in the area since prehistoric times. The ruins of La Cotonilla, the potter"s workshop in Cerro Alcalde and the remains of the Fuente de las Parras date back to the same period. The name "Casabermeja" is probably derived from the Arabic phrase "Qsar Bermeja", meaning "reddish castle". Popular wisdom, however, relates the name to a saying by Queen Isabella I of Castile. When coming to the village, she is said to have cried, "Qué casa bermeja!" ("What a red house!"). Other versions of this legend are popular in other villages of Málaga Province. The Arabs left their mark on the village, too; for instance, there are the stretches of the old city strong walls and the Zambra Tower, from the thirteenth century. However, the village we can see today was founded by the Catholic Monarchs, as reflected in two documents signed by Joanna the Mad (1529) and Charles I (1550). In 1630, the villagers were granted permission to buy their freedom from the Crown. When highway A-45 was built and passed by Casabermeja, this led to a boom in the local construction industry. In the face of development, however, the village managed to keep its original spirit, especially in the earliest population centre: narrow streets, traditional whitewashed houses, and façade niches with little sculptures of Virgin Mary and of saints to kindle popular religious fervour.